About 1.7 million people across the three states affected - North Carolina, South Carolina and Virginia - have been told to leave their homes ahead of the storm's arrival. 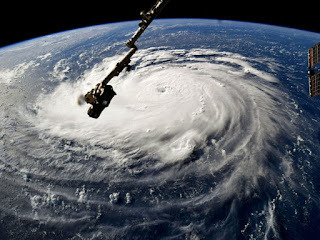 Speaking about the Wilmington area and its surrounding beaches in North Carolina, a Federal Emergency Management Agency (FEMA) official said the inland flooding threat was "extreme". Some 38cm (15in) to 64cm (25in) of rain is forecast in some areas - with up to one metre (40in) at the centre of the storm. Speaking at a news conference, the official said the hurricane was expected to spread out into the Central Appalachian mountains, the Tennessee Valley, and southeastern parts of the US after Saturday. Another FEMA spokesman said: "I need to re-emphasise this is a dangerous storm. We ask you to heed the warnings - today is the day." The lingering storm could bring days of heavy rains, which could spark intense floods from South Carolina to Virginia.